A BUBBLING CAULDRON: Lift Off! - We Have Lift Off! Lift Off! - We Have Lift Off! 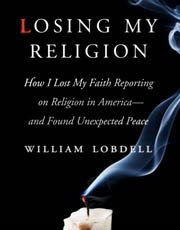 Yesterday's official launch of former Daily Pilot Editor and Los Angeles Times reporter Bill Lobdell's new book, "Losing My Religion - How I Lost My Faith Reporting on Religion in America.... and Found Unexpected Peace", was a rousing success. The event, held at Borders Bookstore at 19th Street and Newport Boulevard in Costa Mesa was, based on reports from the staff, the most successful book signing event ever held at that venue. From what I saw when I arrived late in the proceedings, I can believe it. All copies available were sold out and more than a few potential buyers left disappointed. I'm glad I bought my copy last week! This event was like a Who's Who of former and current Los Angeles Times employees. In front of me in line was former Director of News and Online for the Daily Pilot, Tony Dodero. He pointed out several former Daily Pilot staffers in the assembled throng. Former Los Angeles Times columnist Dana Parsons was observed holding court following the recently-announced demise of his column in that newspaper. He's still with the Times, but his column, along with the California Section, is history after 18 years. Even occasional contributing columnist Gustavo Arellano of OC Weekly fame was in line, carrying copies of his book, "Ask A Mexican! ", apparently hoping to piggyback Lobdell's event. Bill Lobdell has had a very busy week. A quick visit to his blog calendar page will give you an idea. Over the past few days he's had nearly two dozen radio interviews, will appear on local television tomorrow and later next week and is about to jump off on a whirlwind national book tour. Although I got tired just reading his schedule, I have no doubt that tri-athlete Lobdell will handle it just fine. While waiting for Lobdell to sign my copy of his book I watched him patiently chat with each person who eagerly handed him their copy for inscription. It was the end of a long afternoon, yet he took the time to calmly answer questions. As I stood in line with Dodero and others, it struck me that this may be exactly the right time for this book launch. Our country is in dire straits, with citizens being asked to have faith in our new president and his flurry of initiatives to get our country back on course. Faith is what it's going to take, because logic and reason certainly don't lead you to believe his plans can succeed without bankrupting the future of the next couple generations of Americans. And now we have Bill Lobdell's book - the story of his journey to and from faith. If the first few lines are any indication, this will be a tough book to put down. He gets your attention with the very first sentence, "By age 27, I had screwed up my life." You have no choice except to swim right up to that lure and take it in your mouth. With the next sentence, "I had married my volatile high school sweetheart five years earlier, mostly because it was easier than breaking up." he firmly plants the hook and begins reeling you in. I'll be reading the book over the next couple days and will report back. i'm 100 pages in. a fine writer and an honest man; two things we need more!